Hello and thank you! I truly appreciate being asked to be your featured artist for October! Scrolling back through your Waterfront Blog I see you have had a wonderful variety of styles and subject matter from talented and skilled painters, each so distinctive, their work beautiful and beguiling – truly unique. Isn’t that what makes ART so awesome, that it’s a unique, individual expression of an artistic personality. We all have that artist’s soul within us, that desire to produce a work of beauty. Regardless of our skill level thus far attained, we all have an elusive mental image of what we wish to express in paint. Our skills must “catch up with” that vision! That’s where I am – still trying to attain a skill level high enough to enable me to paint what I see in my mind’s eye. A carrot on a stick dangling before my artist’s eye! I like to define my style as “painterly realism”, and am always aiming for loose, fluid brushwork that’s beautiful regardless of whether or not it describes the subject – yet at the same time, wanting the subject to be identifiable and important, infused with my own personal concept of reality. The eye may see as a camera ‘sees’, but the mind’s eye sees an altered, imagined image, what it wants and hopes to see. It’s that illusive image, uniquely mine, along with a heightened sense of ‘realness’ that I try to express in my paintings. This world of ours is often a frightening and mysterious place, but it’s filled with scenes and subjects that excite my eye and imagination! The magical allure of the natural world, and my reverence for it, compel me to attempt to capture its essence on canvas or paper. In addition to having had my work represented by numerous fine art galleries over the years – Esprit Décor Gallery in Phoenix, Arizona currently represents my work – I have been very fortunate to have written and illustrated two books for North Light: Brilliant Color (oil and acrylic, 2009) and Watercolor Unleashed (due for release in 2013) – and to have filmed two Watercolor Unleashed videos (2011) also with North Light. Additionally, I self-publish Watercolor Unleashed! The Notebook (a “chapter-at-a-time binder-book”, 2009 through 2012, ongoing), which was the genesis for my “Watercolor Unleashed series”. My career has been a joy! I especially enjoy conducting painting classes and workshops – for a variety of reasons. For one thing, it’s so rewarding to see that “aha moment” when a painting idea is understood and resonates with someone for the first time! Painting in and of itself is self-realizing and conducive to good mental health. However, I feel like I’m doing something more important when I can participate in helping someone develop their painting talents, the act of painting so often being a source of pure pleasure and happiness. For another, it adds a social element to a very solitary job. I’ve made wonderful and lasting friendships that could have come about no other way. One truly exciting aspect of being a workshop instructor is – believe it – travel! I’ve been so lucky to have been invited as guest artist instructor for workshops around Arizona, California, Wisconsin, North Carolina, Florida and such incredible locales as Canada and Umbria, Italy. About the latter – one of my most exciting painting trips currently scheduled – openings are currently being reserved for my second workshop at La Romita School of Art in Umbria, Italy in June 2013. If you are interested – in that or other workshops – please contact me for additional info at juliegilbertpollard@cox.net. A recent addition to my “teaching” activities is the writing and illustration of “painting tips” e-mails that have proven to be very popular. If you would like to receive these “tips” – TOTALLY FREE – please send me your e-mail address. I look forward to sending them to you and making new painting friends! The mediums I work with are oil, watercolor and sometimes, acrylic. Usually my use of acrylic is as an adjunct to either oil or watercolor. My currently favorite watercolor process begins with a technique I like to call “watercolor in reverse”, thus-named since it begins with the darkest darks using acrylic-as-watercolor rather than the more traditional “light to dark” approach. Watercolor aficionados are usually extremely interested and fascinated by my “watercolor in reverse” method since it addresses several watercolor issues and is an exciting, if a bit non-traditional, method. Here is an excerpt from Watercolor Unleashed! Afraid of the dark? You are not alone! And if this does indeed describe you, your paintings may lack value contrast. You may be so nervous about the possibility of ruining the work that you have labored over that you are afraid to give the painting the punch that it needs. So why not put in the darkest darks first and get it over with? Why not establish the all-important value pattern before you have invested so much time and emotional attachment? You probably have learned from painful experience that if you do this with watercolor, the chances are great that you will need to paint over these darks at some point, at which time they are likely to dissolve into and muddy those subsequent washes. Enter fluid acrylics—acrylics used as watercolor. When dry, acrylic is no longer water soluble. You can paint wet watercolor right over the acrylic and the acrylic won’t budge. The acrylic darks serve as underpinnings to “lock in” your composition. Warning...do not paint with acrylic in an indiscriminate manner if you wish to keep your painting transparent—acrylic is extremely difficult, if not impossible, to remove. The fact that acrylic dries waterproof is an advantage because it is indelible. On the other hand, the fact that acrylic dries waterproof is also a disadvantage—because it is there to stay! Use acrylic when you are quite sure that you know where you want it! Once you have practiced this technique enough to get the hang of it, I advise using it only when it seems clear that there will be a significant benefit to using it on the particular painting at hand. If used correctly you will find it to be a wonderful adjunct to your watercolor “repertoire”. The acrylic doesn’t necessarily have to be done as a first step. At any time during the painting process, when you feel the need for an indelible color, use acrylic. Again, use with care as it will be there forever! Not only does this method get the most intimidating part of painting over with first, it also solves four other painting problems as well. The darks create a pattern that unifies the design, they remain clean and sharp rather than muddy, they open up a range of lighter values, and they create a plan for the painting that allows you to concentrate on and enjoy the painting process. Here you see the “acrylic underpinnings” technique at work in the first stage of the painting. Can you imagine how helpful it was to me to have those very dark areas established early on? Incidentally, for those of you who, like me, indulge in painting with oil as well as water-media, this method is also a favorite of mine for the beginning stage of an oil painting (my favorite oils being the water mixable Holbein DUO Aqua Oil) as seen in my first book Brilliant Color. I love to paint! Each medium has its own personality – I love to alternate between transparent and opaque mediums. Oil being my primary gallery medium and watercolor my primary teaching medium, I have the perfect excuse to use both and can’t imagine being limited to just one. Back to watercolor – especially an expanded “water-media” version – watercolor is such an exciting and expressive medium! You can do almost anything with it, particularly when utilizing the many water based products, brilliant colors, papers, canvases, grounds, etc. that are available to us. We have access to a veritable “candy store” of products and options – we are fortunate indeed! Thanks again for inviting me to participate in your Waterfront Blog this month. Hi Julie, I paint my darks in first too. What is your favourite subject matter/place to paint? My favorite subject? That’s easy – rocks, water and flowers – and if I can get all three in one painting I'm a happy painter! Rocks can be anything from river rocks and boulders to ancient buildings with walls of stone and brick – water, gently gurgling creeks to ocean waves – wildflowers in the desert to potted plants on the patio. I once placed a pitcher of flowers in famous Oak Creek here in Arizona and painted the scene in plein air. Now, that was fun! I have been receiving your painting tips by email for some time now, and I save every one and refer back to them often. You are so generous with your help in this way. Your latest tip on composition is especially helpful, and I am impressed also with your dark to light approach - something I really need to practice. I forgot to ask about the Watercolor Unleashed! The Notebook series. I cannot locate it on your website. I'm glad you like my "tips" - putting them out every week is keeping me on my toes! It's nice to hear about people printing them out. In my classes, I see that they are adding them to my "Watercolor Unleashed Notebook". Do feel free to forward them. RE ordering it, I will send you the info via email. I have never set it up for website purchase though I should do that! 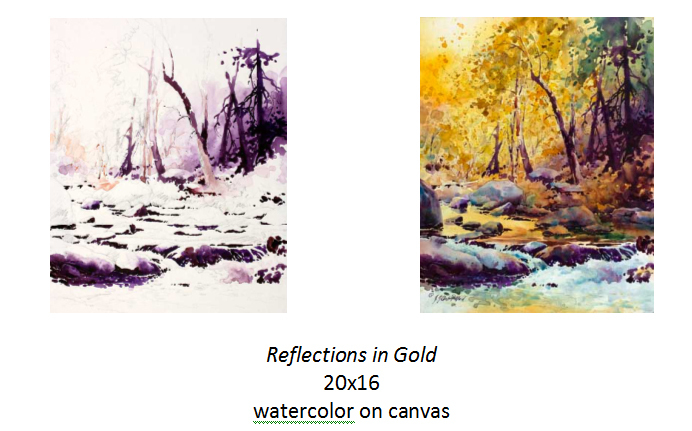 BTW, its original title, Watercolor Unleashed!, has been changed to "WCU! The Notebook" because North Light liked the content and contracted me to do another book for them using the original title, WCU, that is now finished and due for release in March. It will include some of the original WCU content plus a lot more, and of course in a traditional North Light format. Happy Watercolor Painting to you! Hi Julie, Thank you for sharing your work with us. I would love to be able to paint water. If there was one trick you could give us for painting it, what would this be? Water is a pretty complex subject so it’s hard to think of just ONE tip - I’ve got at least a dozen! There are so many different facets to consider: mirror-like reflection except on whitewater, transparency, refraction, it being the flattest surface in nature when still, the fact that shadows fall through water not on water unless the water happens to be opaque with solids (muddy water, etc.) or when the water is frothy; the fact that water seeks its own level, therefore flows, splashes, slides, breaks into waves, channels into currents, etc. And there are more! There is so much to consider, but you want your painting to look fresh and spontaneous, not as if you were laboring over each little element and nuance of the confusing scene in front of you. So my tip is this: study all water features until they are internalized - so that your brushstrokes can flow intuitively. You must not only THINK the water, you must FEEL the water. I have spent so many hours sitting by a creek or pond, drawing, painting and absorbing. The payoff is not only in the water knowledge gained but in the pleasure of all those hours! My North Light video “Painting Cascading Water” and also Chapter 4 of “Watercolor Unleashed Notebook” deal with several aspects of painting water and I’ll be coming out with a chapter on reflections soon. Contact me directly should you wish to receive further information. I hope you will enjoy painting water scenes as much as I do!